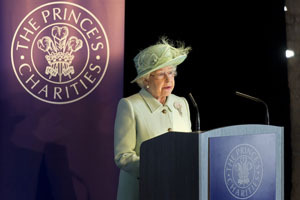 This was the first time HM The Queen spoke publicly about her eldest son’s charity work and my client was keen that I get The Prince’s Charities logo in when she spoke – I got two logos in the one shot! The location was The Weaver’s Triangle in Burnley which is due for regeneration. 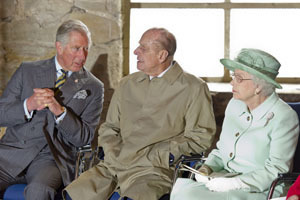 After following the Royal trio around the cluster groups for many handshaking photo opportunities I was ushered into the press pen for the formal speeches (here’s the best picture to illustrate a press pen, just substitute the sheep for people with cameras). The Royals were seated with their backs to a huge arch window, the only light source into the empty warehouse (A photographer’s backlighting nightmare) You just can’t see any detail against the light. I decided to rest the camera on a ledge with a longer exposure and hoped to capture a flash from another photographer’s camera at an angle to me. This is the only one that worked but it works well, I think.